» What Height Is Considered Tall for a Man and a Woman? What Height Is Considered Tall for a Man and a Woman? You are towering almost all of your friends. Sometimes you even feel guilty that you are blocking the people from behind you, especially in concerts and movies. When you are new to an environment, everyone will stare at you and state, “You are so tall!” But, you seem confused whether you consider yourself tall or not. ​But, what height is considered tall for a man and what height is considered tall for a woman? To end the dilemma, we have found out what is the bracket height for tall men and females. Let’s see more here. How To Know If You Are A Tall Man Or Woman? That depends on how tall the people are around you! Each culture has different average heights. You can check out Wikipedia's list for the average heights of men and women by country. If you are standing next to a group of people, especially your friends, you often tower over them. Then, you are tall. You may also assess some photos of you and your friends and see if you are higher than the rest of your friends. But, it still depends on who you hang out with, especially if you are friends with volleyball or basketball players. If you always have a hard time searching for clothes that fit you, especially your pants, then there is a tendency that you are tall. They may be too short to fit your legs. Also, you may even hear your parents or significant others complaining how they have to sew them all over again. If you are new to a place, everyone may ask if you are a belong to the basketbal﻿l or volleyball team. In fact, others may think that you are a model. But, this may tend to be annoying if you don’t play these sports and doesn’t model at all. People would assume things based on your looks, but those shouldn’t disappoint you anyway. In general, boys reach puberty between the ages 9 to 15, while the girls hit puberty in the ages of 8 to 13. It means that you are most probably taller than other kids with the standard height at the age of 11. Also, you are growing faster than a lot of your friends. If you are in a group or a room full of people, your friends and family will always spot you easily because they can see you from afar. Then, you do not have to doubt yourself: you are tall! They can see you in the crowd because you are towering over the people and you stand out quickly. There is nothing wrong with that, right? In some high school or middle school dances, you may be taller than your partner. Some girls find it too awkward to be taller than their prom dates. But, you need not discouraged. There is a good chance that they will grow taller when they come of age. What Height Is Considered Tall For A Man? You can check the latest official data made available on the United States height statistics at the site of the United States Department of Health and Human Services, Centers for Disease Control and Prevention. They based the data on the CDC National Center for Health Statistics, National Health and Nutrition Examination Survey or NHANES. ​They have concluded that males in the U.S., 20 years and above in all ethnicity or age groups that are 6’2” or 72 inches tall belongs to the 95th percentile. It means that 5% of males 20 years and over are tall with the height of 6’2”. What Height Is Considered Tall A For Woman? In some cases, people view the height 5’5” as the average height for a woman. Then, they think 5’9” or 175 cms as the height for tall women. But, why is this so? It is because this is the benchmark for female models. It may seem like a standard height for women, but one study points out that only 5 percent of women have the height of 5’9” or above. ​And in the survey above, they have also found out that females in the U.S., which is 20 years and above with all ethnicity and race groups have 68.1 inches height or 5’8”. 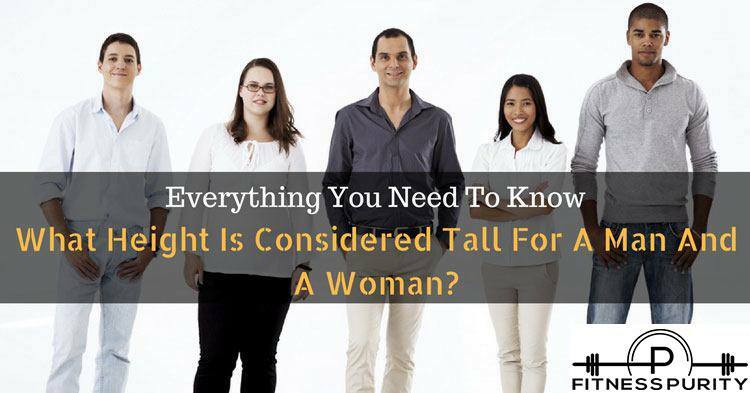 It covers the 95th percentile, which means that 5 percent of women 20 years and over are tall with the height of 5’8”. Some women think they are short even when they are already tall enough. Other men may even consider themselves tall when in fact they do not belong to the average height of males. So, to make things straight once at for all, we have provided the data above to show you when you can consider yourself tall. If you are interested in how exercise may affect your height, we here at Fitness Purity have got you covered. Take a look at How Do Pull Ups Help Increase Height? if you are looking for a good exercise to strength you out and improve your posture. Also, if you have ever wondered: "Do Squats Make You Shorter?" then we have the answer. ​But, take note that tall or not, male or female, you should not view yourself as just that aspect. Height is just one part of you. Don’t even allow this factor to control your life. Always remember: be you and be confident. Previous Post What’s the Best Knee Ice Pack? – We Review 5 Options Next Post Why Are Fat People Strong? Will I become Stronger if I Gain Weight?